As presidential candidates focus on border walls, dirty tricks and massive increases in spending, it would be nice if, just for a moment, one of the prospective leaders of the U.S. would pause and consider the state of the nation’s finances. The economic recovery that followed the Great Recession and continued strong job growth may have combined to shield Americans from some unpleasant truths about the country’s fiscal future. University of California-Berkeley economist Alan J. Auerbach and Brookings Institution economist William G. Gale have published a new paper that runs the numbers on the federal debt and deficit over the medium-term and long-term. Not only is the picture they paint not a pretty one but it has become dramatically worse in just the past few months. For instance, looking at the same data in September, Gale and Auerbach predicted that the country’s debt-to-GDP ratio would rise from 76.6 percent to 81 percent by the year 2025 – the end of the 10-year “budget window” used for most analyses of federal spending. Revisiting the data today, they find that the projected ratio in 2025 has jumped to 91 percent. Even recent signs that the Federal Reserve’s Open Market Committee is recalibrating its approach to normalizing interest rates doesn’t hold much promise for improvement, they found. “Lower interest rates, of course, reduce net interest payments, but even with flat interest rates, the fiscal situation is headed in the wrong direction,” they said. 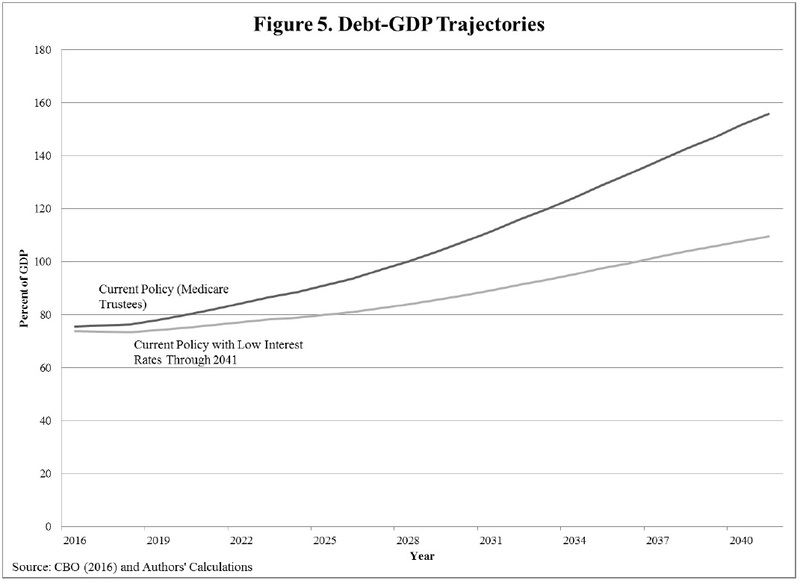 Even after adjusting their model to consider the impact of flat interest rates for the next 25 years, the gap between projected spending and revenue needed just to maintain the status quo on debt-to-GDP is 1.8 percent of GDP. “Thus, while low interest rates may reduce net interest payments in the near term, they do not put federal debt on a sustainable path,” Auerbach and Gale write. Fixing the problem, they point out, will require a legislative effort unlike anything Congress has been willing or able to accomplish in recent years. While innocuous at first glance, that little aside points to one of the biggest obstacles in the way of serious fiscal reform right now: in a political environment in which Congress consistently avoids acting on problems until the last possible moment, marshalling the legislative firepower necessary to solve major problems whose impact won’t be felt for years seems to be beyond the abilities of our lawmakers. Did the Head of a Pro-Bush Super PAC Make $14 Million? Is Trump Leading the Republican Party to the Edge of a Cliff?